The Portuguese built a string of forts and stockades during their occupation of Sri Lanka. They were initially wooden stockades of coconut trunks piled on top of the other or rammed earth. Later, forts with walls of brick or stone and lime, with bastions and ditches were built. They were manned by Portuguese garrisons and Sinhala lascarins. These Portuguese forts have not lasted. 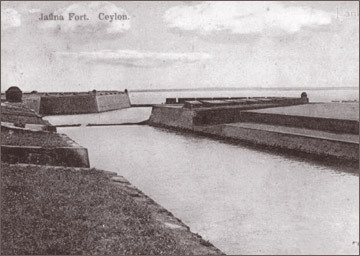 The first fort was in Colombo. In 1518 Portuguese captain Albergaria arrived with about 700-1000 soldiers, material and workmen and with the consent of the Sinhala king, Vijayabahu VI, built a factory which was garrisoned. In 1520 Lopo de Brito arrived from Portugal with four hundred men including stone masons, and carpenters, with special orders to construct a proper fort. .The original fort was of wood. The fort was enlarged, amidst much opposition from the Sinhalese, into a stone fort mounted with canon. It had a moat which ran from sea to sea converting the fort into a tiny island. In 1521, Vijayabahu waged a war against this fort. The attack failed but the fort was dismantled in 1524. It was rebuilt later and Vijayabahu's successor, Buhavaneka bahu VII, who became a pawn in the hands of the Portuguese offered to help them strengthen the fort if they supported him against Mayadunne. Between 1594 and 1600, 22 forts were constructed, mostly in Kelani and Kalu Ganga basins with some facing the Udarata border. Forts were built at Alauwwa, Attapitiya, Batugedera, Chilaw, Deewala, Delgama (Kuruwita Korale) Demunugashinna, Diyasunnata, Etgaletota, Galle, Gurubewila, Kalutara, Katugampola, Malwana, Matara, Menikkadawara, Mottappuliya, Negombo, Pentenigoda and Ruwanvella. There was also a stockade at Sabaragamuwa and a gunpowder factory which could turn out about 160 pounds of gunpowder daily. Abeyasinghe says all place names excerpt Etgaletota and Damunugashinna have survived. . Many of these forts were abandoned once Portuguese rule was established but the forts of Colombo, Negombo, Kalutara, Malvana, Galle, and Manikkadavara were retained and strengthened. In 1608 a Portuguese visitor stated that the Portuguese had two main fortresses, Colombo and Galle. They are strong and well garrisoned with soldiers, who are mostly criminals and exiles. Manikkadavara fort was of stone, and took four months to build. It had a two storey tower. Manikkadvara was the launching point for the numerous Portuguese invasions of Udarata and for controlling Satara Korale. More than half the army was stationed there. The Udarata facing forts kept the Undarata kingdom under a state of siege on the western side. Wimaladharmasuriya I constructed forts at Mottappuliya, Kirivallapitiya and Talampitiya in close proximity to the Portuguese forts at these locations in order to contain and block the Portuguese fortifications. By 1620 the British and Dutch traders had become powerful in the Indian Ocean. The Dutch were firmly established in Indonesia and were threatening the Portuguese possessions of Macao and Malacca. The Portuguese fortified the main ports along the sea coast. They planned to get these set up by a qualified engineer and Portugal was asked to send an engineer for the purpose. In 1620, they changed the location of the Galle fort. They moved the fort to the rocky coast of the promontory and gave it protecting walls. A bastion on the southern end commanded the entrance the harbour. There was also a wall on the landside. The Portuguese authorities in Lisbon also wanted Weligama fortified and a Portuguese settlement established there. But those in Sri Lanka were not in agreement, saying the Galle Fort was sufficient. In 1623, the Portuguese built a fort in Trincomalee, dismantling a Hindu temple which stood there and also set up a small Portuguese settlement there. Franciscan priest, Fr Santiago was sent to Kandy to persuade king Senerat to permit this since the building of a Portuguese fort was a violation of the 1617 treaty between the two parties. Puttalam was fortified in 1625 and Batticaloa in 1628. Ten coastal towns were also fortified, Alutgama, Colombo, Chilaw, Galle, Kalutara, Matara. , Negombo, Panadura and Valigama, compelling the Sinhalese to reside within these towns and settling immigrant Indian and Portuguese amidst them. The fort in Colombo was enlarged and strengthened. Houses were constructed and a Portuguese city created. There were 500 houses accommodating Portuguese as well as Sinhalese. There were well laid out streets with handsome mansions and four convents of the four orders. Outside the walls the Portuguese had their villas. The Portuguese built several forts in the north. These forts were built by the sea since access by sea was crucial. The Portuguese started to build a fort in Jaffna in 1625. In 1637 it was still being built. , according to Queyroz, the Jaffna fort was a square one with four bastions. In the middle of the walls, there were semicircular projections which were possibly used as musketry platforms. The sea protected the fort on one side and on the other three sides there was a ditch. Brohier notes that the Portuguese also built the 'picturesque little water fort 'later called Hammenheil by the Dutch. It was built on a coral bank at the entrance to Jaffna lagoon. He thinks this was probably intended to provide cross fire, together with the Jaffna fort. The Dutch records refer to a Portuguese fort at Point Pedro. They speak of breaking the coral stone in this Portuguese fort. The Dutch had turned this into a fortlet, a stockade built of wood and mud. It is noted on the Dutch maps .This fortlet has now disappeared. .
Brohier says that one of the two forts found at Delft is a Portuguese one. J.D. Pearson, then Director of the Colombo Museum, noted that its southern face was ' most perfect '. The roof line is clearly marked at a height of nearly thirty feet above ground level. The remains are sufficient to reconstruct the whole building. The fort seems to have been rectangular in shape and its lower walls were so well built and sufficiently buttressed that the fort probably consisted of two storeys. Probably one of the early examples of enclosed defences known then as 'tranquira'. The Portuguese also built a fort at Kayts. The Sinhalese never had the need to construct permanent forts. They constructed temporary forts when under invasion. The Portuguese and the Dutch were outsiders seeking protection from the natives. The Portuguese always averted final defeat by retreating to coastal forts where they were relived by reinforcement and supplies from their strongholds in India. The writings of T.B.H. Abeyasinghe, R. L. Brohier, C. R. de Silva, D.G.B. de Silva, J.M. Flores, C Gaston Perera, P.E. Pieris and G.V.P. Somaratne were used for this essay.